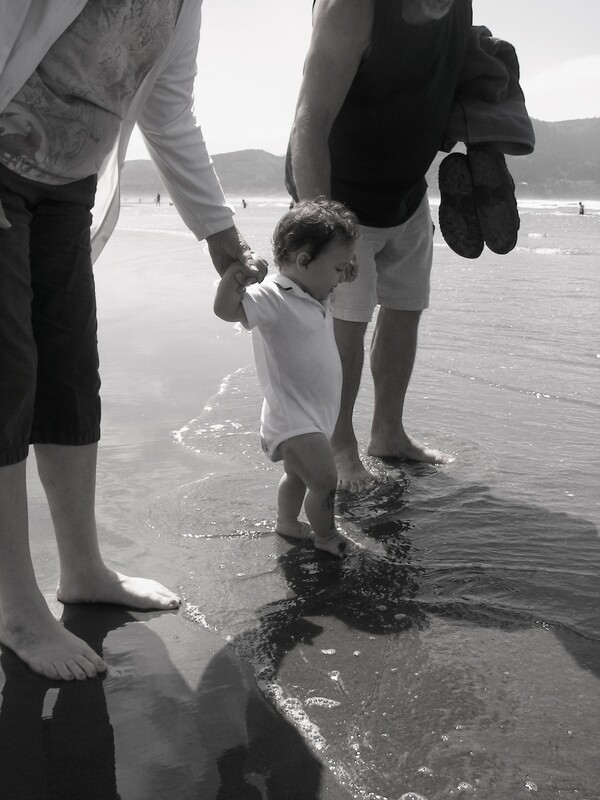 Pillars in the Waves » Core Parenting - Parenting Resources in Portland, Oregon. As a child I remember standing in the ocean letting the waves wash over my feet. I was exhilarated by the power and strength of each wave. I would watch in anticipation, hopping from foot to foot, as the waves built up and came closer to shore. As they got closer, I would reach for my dad’s hand, making sure he was close. I wanted to stand on my own two feet, but I also wanted to make sure that he was near by if I needed him. As the waves washed over me, I was always surprised and sometimes overwhelmed. A mixture of fear and glee filled me. My tummy tickled and my heartbeat quickened. The cold water took my breath away and I could feel the tricky sand shifting under my feet. I wondered if it would sweep me out to sea. I felt proud, relieved and excited as I realized I was still standing strong as the wave retreated. I jumped up and down and pointed out, yelling up to my dad “Look!” as I waited for the next one. Sometimes I managed the waves on my own. At the edge of the water I felt pretty confident in my ability to stay standing. I also knew that if I fell, I could easily get back up. I could toddle around in the easy waves on my own, my parents safe within my eyesight. I checked often to make sure they were there. But as I went deeper, I wanted them close. A little farther in and I needed my parents hand to keep myself steady. A little bit farther and I wanted to be safe in their arms. They were my pillar. I trusted that the waves wouldn’t wash them away and that I could use their strength (either in the arms, holding their hand, or just being near them) to brave the waves that would have otherwise been too big for me, the waves that would have washed me out to sea. They gave me the strength, power, and courage to learn how to play in the waves on my own. As I think about parenting today, I think of these pillars and waves. Growing up can be scary, tricky and overwhelming. To little ones, emotions, problems and challenges are just like waves. They look on them with anticipation. “I can do it myself!” They become quickly overwhelmed when the waves are bigger than they expect. They fall down when the tricky sands shift underneath them. If we support them in mastering the small waves first, they will soon be ready to take on bigger ones. Little by little, they get stronger and more experienced in negotiating the waves of life. Little by little, they move farther and farther from us. Their parents. Their pillars. Sometimes they just need us close. Sometimes they need our hands. Sometimes they need to hide in the warmth of our arms. Even as adults, it never really changes. Our parents are our pillars. Just a few years ago, during an emotional crisis I flew across the country to be close to mine, their voices over the phone just weren’t enough. I needed to be close to my pillars. The waves were just too strong. If my parents had never let me out of their arms to feel the power of the waves myself, I never would have learned to play in the ocean. But if they never held me close, I wouldn’t have ventured out. And if I did, I might not have been ready. Likewise, if we never let the little ones experience the rush of life, the power of emotion, the trickiness of challenges they will never learn to live life to the fullest. The challenge then, for parents is to know when to stand close, when to lend a hand, when to hold them close, and when to back away.